Access resources to learn about the Salesforce mobile app. Build an effective mobile rollout team. Demonstrate the Salesforce app to your company. Pitch the Salesforce app to executives. Your mobile metamorphosis is complete–you’re in the mobile mindset and full of ideas for use cases. Now you’re ready for the next stage of the rollout process: learning and evangelizing. In this stage, you absorb all the information you can find about the Salesforce app and get your hands dirty by playing around with the app. Once you become a mobile expert, it’s time to rally the troops, spread the word at your company, and build support for your mobile initiative. After all, you’re going to need some help to make the mobile launch as successful as possible. Complete the Salesforce Mobile App Customization module. This is the best place to start. You can learn the basics and find out how to tailor the app to meet your company’s needs. Watch Part 3 of the Jump Start Your Mobile Strategy with the Salesforce App webinar to see a demo of the app and the setup process. After you’ve gotten more familiar with the Salesforce app, it’s time to share your knowledge with your company. But who should you share it with? It takes a team to roll out any Salesforce project, and there’s no better time to involve your team members than right at the beginning. Identify key stakeholders across departments and form a committee, helmed by an executive sponsor who is invested in Salesforce. This step is critical. Whether you’ve already committed to rolling out the mobile app or you’re still evaluating it, you need executive support to ensure you’ve got resources and alignment to succeed. In addition, you need the right people from across the company to join your project team so that every department’s needs are met. As you form your project team, keep in mind that depending on the size of your company, you might have people who fill multiple roles (or “wear multiple hats”). Super users are employees who understand the vision and value of your implementation, want to help you optimize and improve what’s in place, and are passionate about helping others adopt Salesforce. These champions often answer questions and provide support to their coworkers, so they can be your evangelists in the field, helping to spread the word virally and increase adoption. And when it comes to rolling out the Salesforce app, super users can help make your project a success! Work with your executive sponsor and stakeholders to identify a group of mobile super users. Involve them in the rollout by giving them early opportunities to train. Seek their feedback on your marketing and communication plans, and consider asking them to help train users, with a train-the-trainer approach. Well, remember all those sweet use cases you developed? They’re your secret sauce for selling the benefits of the app and winning support for your mobile initiative. Create a presentation deck that highlights your top use cases. For each use case, emphasize how the Salesforce app can help users and deliver business value. In addition to sharing the presentation, consider providing a demonstration for your team. One of the best ways to educate your team on the Salesforce app is to demo it. You can demo the app right out of the box, but your demo will be more compelling if you spend a little time customizing the app so it reflects your specific use cases. We cover customization more fully in the next unit, but for now, let’s go over a few best practices for giving a demo. Include demo data Create sample records for all the features and use cases you show. Tell users’ stories as you showcase the app Use real-life examples as the stories to drive your demo. For example, consider adding real user photos to the user profiles. Test everything beforehand If you’re planning to show any customizations you’ve added, make sure to test them first. Be prepared for questions There are some differences between the Salesforce mobile app and the full Salesforce site. Be aware of potential feature gaps so you can propose workarounds if a team member asks. Practice makes perfect Run through your demo in advance to make sure you’re ready and practice the flow of how to demo the features. Record your demo If you record your demo, you can easily share it with people who couldn’t attend in person. The recording can also be a great training asset later! 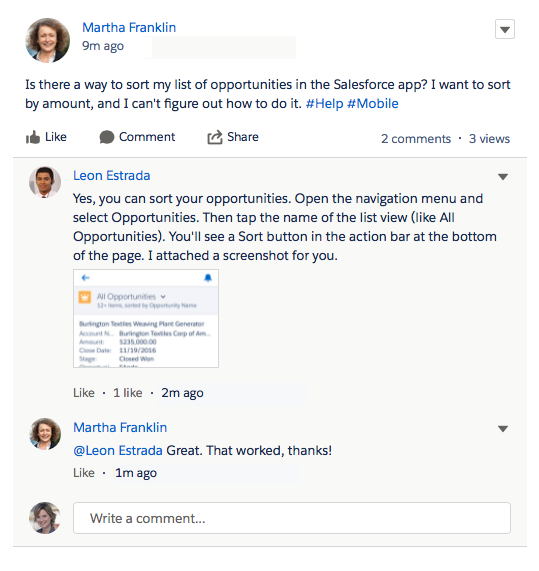 If you’ve been working with the Salesforce app on your phone, you might be wondering how to share that tiny screen with people in a meeting room or web conference. Luckily, you can use something called a device emulator to demo the mobile app from your computer. We talk more about emulators in the next unit. Of course, the demo is only half the battle. Whether you like it or not, getting buy-in for your mobile rollout involves a sales pitch to a critical team member: your executive sponsor. Executive support is a huge factor in the success of a mobile rollout, so you need to sell your vision for the Salesforce app and convince the executive to back your mobile initiative. Don’t go alone. Bring a manager who understands your vision and can support your claims about how users will benefit from mobility. Keep it brief. Executives are busy, so get to the juicy part fast. Avoid a long opening and jump right into the benefits, use cases, and demo. Focus on business value. When presenting your use cases, try to align your message with things executives care about: growing the business, retaining existing customers, increasing customer satisfaction, and beating competitors. How will the Salesforce app make users more productive? How will it help the company sell more, or sell faster? These types of questions mean that your team members are thinking about how different processes will work in the mobile app. This is good, but sometimes revisiting a process and improving it is a better next step. In other words, maybe “the way we’ve always done it” isn’t necessarily the best path forward. That’s especially the case with mobile, and you may need to help your colleagues make the shift to a mobile mindset. As their trusted advisor, you can help your company see that changing their processes to adapt to the Salesforce app can actually make users more productive. So how do you do that? It’s easier said than done, but start by asking more questions. How can you break up the processes into separate steps? Which steps make sense to complete from a mobile device? Let’s look at an example. Let’s say you’re a Sales Cloud customer, and your sales reps need to request deal approvals. Currently they have to complete a complex approval wizard with over a dozen steps. Yikes...that’s not micro-moment material. So ask yourself this: What needs to happen to kick off the approval process? What’s the minimal effort required on the part of the rep? In our example, maybe it just boils down to sending an email to the first person in the approval queue to get things started. Then reps can complete the rest of the updates when they’re back in the office. So on the back end, you set up a custom action that triggers an approval email when the rep updates the opportunity from the Salesforce app. Bingo! Your reps save time and close deals faster, all because you broke up the steps in a process that would have been tedious to do from a phone. 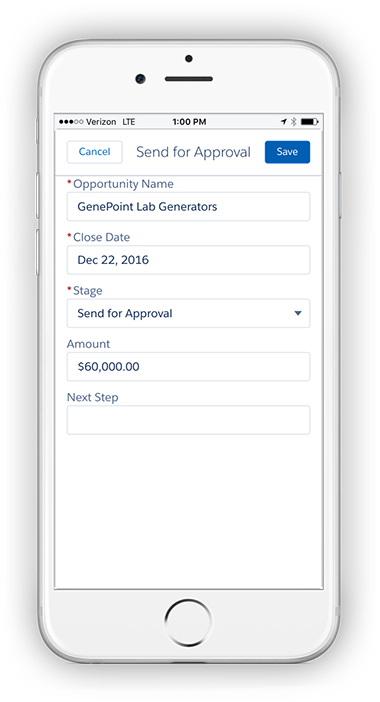 OK, now that you’ve assembled your committee and rallied support for the mobile rollout, it’s time to start customizing the Salesforce app so it meets your company’s needs.